Born in Leeds but of Scottish parents, Ian Weatherhead went to school initially in Yorkshire and finally in Scotland where he was a pupil of Willie Wilson, ARSA, the stained glass artist, printmaker and watercolourist. The influence of Wilson remains as strong now as it was then with other influences being Raoul Dufy and John Piper. He studied architecture at university and practised until the end of the 1980s. Since then Ian has devoted himself full time to painting. 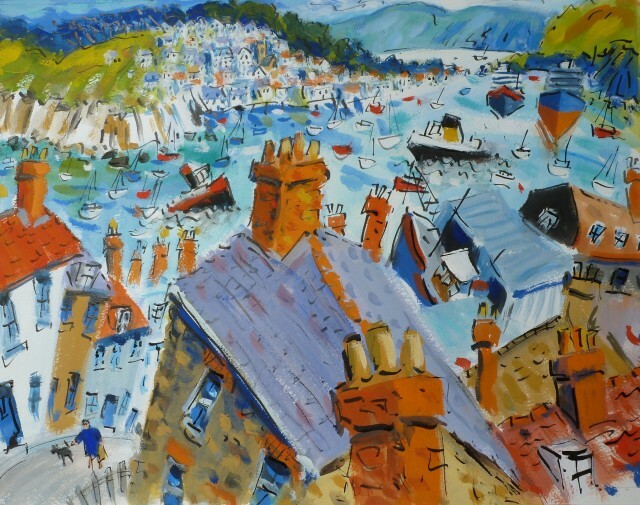 Ian’s paintings evoke an enjoyment of life, whatever his subject. There is a freedom in his work, a vibrancy of colour and line, controlled by an underlying sense of structure carried over from his days as an architect. Each scene is interpreted with an expressive sweeping perspective, which is distinctive of his style, though the liveliness and freshness in his use of colour give his work a great subtlety and charm. He is one of Britain’s most original watercolourists, achieving the recognition he rightly deserves for his masterly paintings. His aim is to inform the viewer of all the elements that have served to inspire the subject and feels strongly that one should be as aware of those items not directly seen, as those that are in the picture. Recent works show the increasingly strong influence of light on his subjects and many have a marked anecdotal content. Ian has won several prizes for his work including in 1991 the Catto Gallery award at the Royal Watercolour Society and more recently, St Cuthbert’s Mill Prize given at the Royal Watercolour Society in 2003. His paintings are in many public and private collections both here and abroad, including the House of Commons.